Clean a little bit greener with this green microfiber cleaning cloth! This 16" x 16" green microfiber cleaning cloth reduces the amount of chemicals and water needed to keep your bar, counters, or tables clean, removing more bacteria than regular cotton cloths. Quick drying and non-abrasive, this polyester/polyamide microfiber cloth provides lint, scratch, and streak free cleaning. It's also great for dusting. Thanks to its lightweight design and soft texture, you can clean with comfort! Great microfiber multi-purpose towels, great solution to clean kitchen surface the cloth absorb a lot of water so it's easy to use and afterward clean great product! We like this product 16" x 16" Green Microfiber Cleaning Cloth - 12/Pack, its perfect to clean all different surfaces, the quality of this microfiber is really good and also the price. Before we started to purchase these cloths we were using paper towel and going through way more money and being more harmful on the environment. We use these towels for everything! I really love these microfiber cloths. They pick up dust, pet hair, and small particles very well. When wet, the texture works extremely well to wipe away smudges and clean glass. It's best to wash them without fabric softener or dryer sheets. This microfiber cloth is soft and gentle enough to dry fragile dishes but sturdy enough to wet and scrub the food off plates. Throw it in the wash when you're done and start over. Good product! These microfiber cleaning cloths are super soft and absorbent. I typically use this for wiping down or drying off countertops after cooking. The green color is way more fun than a boring white cloth. These are quality microfiber cloths for the price. Each towel works great for removing dust and dirt. These are also machine washable and reusable making them eco-friendly too. These Microfiber cleaning cloths are great for the Barista stations at our cafe. They really do absorb a lot of water and coffee spills! We recommend them. 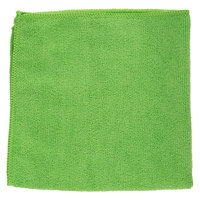 Light weight and easy to wash, this microfiber cloth is green. Its size measures 16x16 inches, and it thoroughly cleans and polishes with little effort. These microfiber cloths are a great value product. Perfect for cleaning any surface and can be used wet or dry. Removes dirt and smudges from windows with ease. We love these microfiber towels. These work great for cleaning just about any surface. Removes smudges and fingerprints with just warm water and a little wiping. Great product! These microfiber cloths are fabulous! I can clean my car windows or remove water spots from the paint without worrying about scratching the finish. I highly recommend! These microfiber cleaning cloths are an excellent choice for any restaurant and our back of house team loves these. It's nice that they offer several color options because you can use them to keep track of which cloths belong at various stations. We love this product for our professional window cleaning. it's great for absorbing excess water along windows. The larger size makes a difference as we're able to use this towel over and over again. It also cleans very easily - just throw in the wash with mild detergent on cold water and hang dry. It's also good to use for residential/commercial cleaning, particularly on horizontal surfaces. You need very little product to clean granite/wood. While the color green is a little daunting, it is great to have a variety to designate them for different things- like green for drying fruits and veggies after washing them. Great cleaning cloth. We use the green ones when handling vegetable messes where meat contamination is not a problem. They are easy to clean and leave no streaks on glass or stainless. Once wet, they are plenty absorbent. This Microfiber has been threaded to make polishing surfaces easy such as glass and wood surfaces. Purchase them in bulk, measuring size 16" X 16"
I like that they come in different colors to differ the cleaning solution. They clean my surfaces really well. Would recommend them and order again. Love them. Green is our color for everything kitchen. Once again color coding at work. Easy to use and washes up great. No shrinking or color bleed. For the price, this is a great quality cleaning cloth. These are good for a wide variety of cleaning situations. You can clean a kitchen, car, etc. 16"x16" green microfiber cleaning cloth! I always use these for the counters and tables. Wipe the seats and walls down too, this makes it quick and easy as it holds the cleaning solvent your using and lets you wipe down quickly. This green microfiber is my go to for wiping down the griddle after cleaning. I use it damp. We also use it for daily cleaning in the green pail. This color green is very pretty and that is just a bonus because the cloth is a home run too!! Tackles any job big or small. The 16" x 16" Green Microfiber Cleaning Cloth works great for dusting! The quality definitely met my expectations. The price is very reasonable. Highly recommend! The microfiber cleaning cloths are great to have on hand. It cleans so well without fear of scratching anything. We use it a lot on stainless surfaces. I will say that I cannot find any microfiber cloths like these for any where near the price I can find them on Webstaurant, especially the nice green color! They work really well as I am in the construction business, and need a good quality cloth for a really good cost. I definitely recommend these as a good alternative to store types! Microfiber cloths are easily one of the best cloths to use while cleaning. Not only is the product itself inexpensive, it also saves you money on cleaner. This one is green, clean and is a nice looking but effective towe. These microfiber towels are great for drying glassware. They are absorbent and they remove any water spots without leaving a linty residue or any streaks. I love the bright green color! This microfiber cleaning cloth has great durability. It has been washed several times and it is still holding up great. It is worth buying a bunch. I just love these microfiber cleaning cloths. They come in different colors, which works great if you want to color coordinate your cloths for different work purposes. These cloths are highly absorbent, which is effective for trying to save on cleaning products/detergent. When they're first used, the green dye comes out and into the cleaning solution, which isn't problematic for the most part. So far they have been quick easy to clean. They are very good for the price we paid for them, we are very satisfied with this product. RECOMMEND TO GET IF YOU USE THESE TYPE OF ITEM. So happy with these cleaning cloths! The price is way better than one that I have ordered from other places, and the clothes are nice and thick and do an awesome job!! Thanks! Used the 16" x 16" Green Microfiber Cleaning Cloth - 12 / Pack cloth to clean my island at home. The cloth is so big that it is able to cover a lot of ground. Very strong and sturdy fabric. We got these for use in our kitchen area, getting multiple colors so that we could control the cross contamination. We were please to see that there was an option for different colors. We are using these to clean off the counter tops in the kitchen. They aren't anything too amazing, but they get the job done and don't break the budget doing it. This green cloth is great for laying out under vegetables, it helps keep them dry without holding on to excess moisture. THey can be reused. These towels are the bees knees! They not only work great dry, but also work even better wet. Love the bright colors, easy to organize. These cloth are quality cloths that can be used over and over again. We use them in our business to keep the counter clean. Try them! this microfiber Cleaning Cloth are very good quality, are very heavy and strong, you can use with Chemical or for the Glasses. I love it and the color doesn't change during the time. The cloths are great for cleaning. We mainly use them for stainless steal appliances as the are not rough, do not leave streaks and dry very quickly. All around great cloths that come in a myriad of colors. I love the size, I love the texture, and I love how effective these cloths are at cleaning! The price is great, especially as it's a multipack. Definitely recommend! LOVE these towels! Extremely absorbent, not too large and not too small, perfect for continually cleaning up around the sink area of our juice bar. No fluff/lint coming off these towels or fraying around the edges. Perfect! This microfiber cleaning cloth is a staple in my kitchen. No job is too big or to small, this cloth picks up all liquids, great for drying and will not leave any lint behind. It works great to shine silverware with some hot water and they will be very sparkly. In terms of keeping the windows clean it does an amazing job. It scrubs away stains and is gentle on painted surfaces. At this price it's a great deal. I use this cleaning cloth to wipe my Kitchen counter, clean my stainless steel refrigerator and microwave. It is very absorbent and leaves no residue. I found something similar at the store and bought it and realized that not all microfiber clothes are the same. It's just not as absorbent as this. Love these. We use them at every account we clean. I love the fact that they don't leave any lint like other cloth rags. Hint - DO NOT use fabric softner when washing. Microfiber is awesome for towels. Makes wiping off cabinets tops, tables and drying dishes and utensils a breeze. Use them every day and they are holding up well. Through the laundry and they are as good as new. Buy these, you won't regret it! I've always used other cloths, paper towels, etc. These work much better when you can't have any particles of cloth on your item. Just can't get enough of these cleaning cloths. Got to have some more. We use them for pretty much everything. More effective that paper towels. Microfiber cleaning cloth is super absorbent. I love how they cut down cleaning time. Wiping up spills is a breeze. A quick run through water is enough to clean them temporarily. Glad Webstaurantstore offers this 12 case at a super low price. This is an absorbent towel that is great for cleaning up spills and drying items. It is a very affordable towel that is nice for washing and drying cars too. microfiber absorbent great. it helps to clean morros, glass on microwares, car windows, glass tables dont live lent behind eiter. and at a great low price. This is a great micofiber cleaning cloth. It comes at a fairly cheap price too. It is ideal for wiping down delicate items. very absorbant. What a wonderful cleaning cloth!! Microfiber material is very absorbent!! Great for cleaning up small spills and even wiping down at the end of a busy shift! !